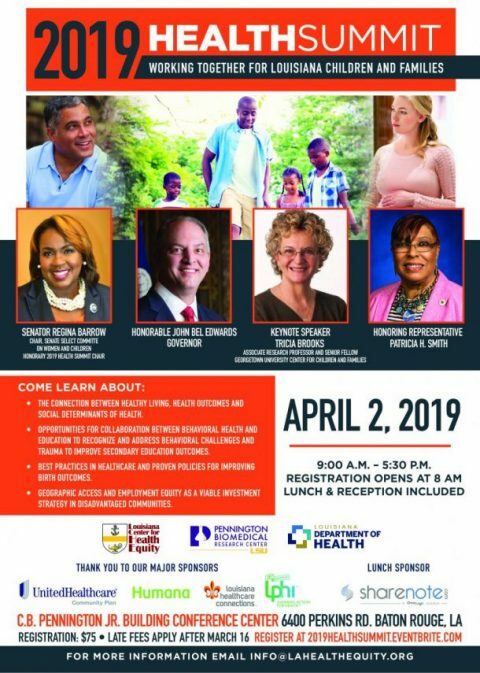 The Louisiana Center for Health Equity in collaboration with the Louisiana Department of Health, Office of Public Health and Pennington Biomedical Research Center is pleased to announce the 2019 Health Summit: Working Together for Louisiana Children and Families. This summit will bring together leading voices on improving the health and well-being of children and families. Healthcare professionals, service providers, insurers, researchers, educators, faith-based and non-profit organizations, law enforcement, and businesses, as well as policymakers, local and state elected officials, advocates, community health leaders, and the general public will convene to work collaboratively on developing and promoting policies to support children, youth and families across Louisiana. We are pleased to announce that Governor John Bel Edwards will open the summit this year. Senator Regina A. Barrow, Louisiana State Senate, District 15 will serve as the Honorary Chair. Senator Barrow is the Chair of the Senate Select Committee on Women and Children. Tricia Brooks, Associate Research Professor and Senior Fellow at the Georgetown University Center for Children and Families will serve as the summit’s keynote speaker. Secretary, Louisiana Department of Health, Rebekah Gee, M.D. ; Louisiana Department of Health-Office of Public Health Assistant Secretary, Alexander Billioux, M.D. ; Secretary, Louisiana Department of Children and Family Services, Marketa Garner Walters and several national and state public health and education experts will serve as presenters. Check out the Health Summit Preliminary Agenda. Attendees can expect to learn from Ms. Brooks and more national, state and local leaders and subject experts. Our session topics include: improve access to health care, support behavioral health, promote healthy living and economic development. The connection between healthy living, health outcomes and Social Determinants of Health. Opportunities for collaboration between behavioral health and education to recognize and address behavioral challenges and trauma to improve secondary education outcomes. Best practices in healthcare and proven policies for improving birth outcomes. Geographic access and employment equity as a viable investment strategy in disadvantaged communities. Early Bird registration rate - $50 until January 25 or until sold out. First come first serve. Lunch and a reception are included in the registration. Resource tables for non profit community organizations - $150 through March 21 or until sold out. For Partnership Package, click here. Should you have any questions or like additional information, please e-mail us at info@lahealthequity.org. If you will be traveling to the conference from out of town, you may reserve a room at the DoubleTree by Hilton Hotel at the “Summit Rate.” The Summit Rate is available from March 31 to April 4 for $100 per night. Click here to book your reservations with the Summit Rate applied. You may also call the hotel directly at 225-925-1005 and ask for the LA Center for Health Equity - LCHE 2019 Health Summit rate. The group code is LCH.